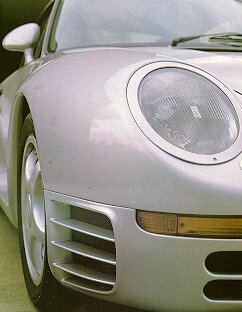 While the 959 was derived from the 911, only a small hint of the 911 shape remains. 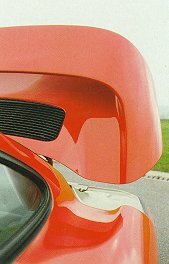 A good deal of research was done into the lines of the bodywork, in order to adapt the characteristics of the 911 to the fundamental headings in the 959 project. Careful study of the profile of the wheelhouses, the air intakes, the shape/slant of the windows and the way they were fitted to the bodywork, the accessories, the wheels, the lower part of the monocoque and the rear aerodynamic surface resulted in bodywork which is still strictly related to the 911, and is aesthetically very pleasing, yet has an extremely favorable penetration coefficient (Cd=0.31). At the same time, working on the same elements, the lift of the bodywork itself has been eliminated (Cl=O). Two extremely important results, giving higher performances linked to higher controllability. 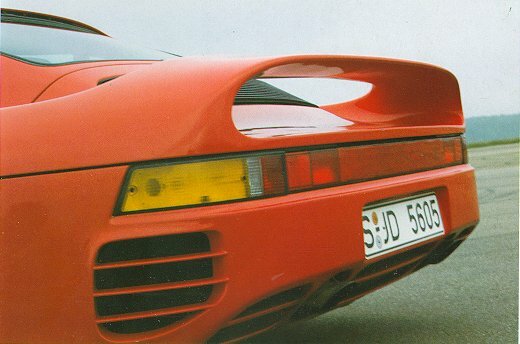 The structural and aerodynamic studies carried out were so detailed and uncompromising that the 959, whilst being clearly recognizable as a descendant of the 911, has retained nothing but the rear stop-lights of the classical production Porsche. As pictured above, the entire tail section of the car is one component--that is, there is no engine cover as in the 911. This creates a much more fluid look as well as allowing for the wrap-around spoiler. This feature virtually eliminates lift and unstability at high speeds. Various slots and vents have been designed for airflow, especially for crake cooling. Notice the taillight bar, the only remaining 911 trait. The air intake hole seen here was adapted to provide air to the intercoolers. 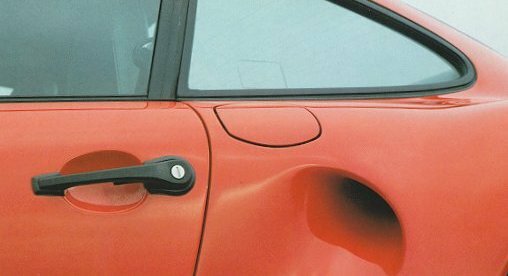 Perhaps a fitting addition to the bulging fender, this functional design was a trademark for Porsches to come. Seen on later 911 Turbo S specialties, this intake vent became standard for top of the line 911s.